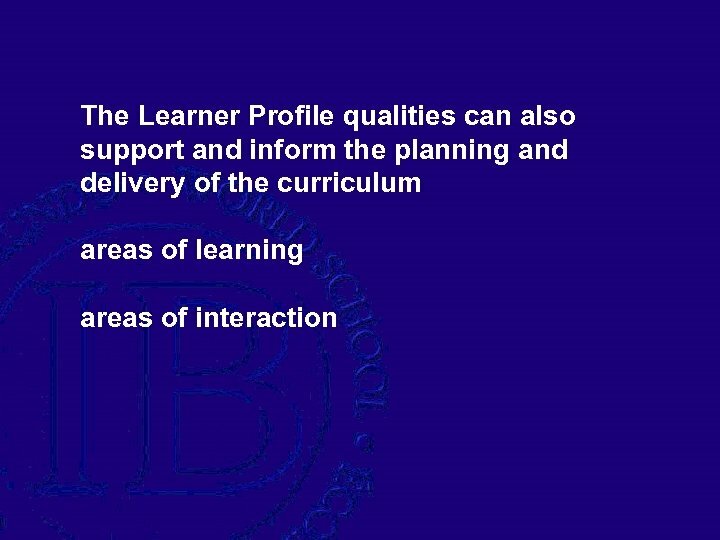 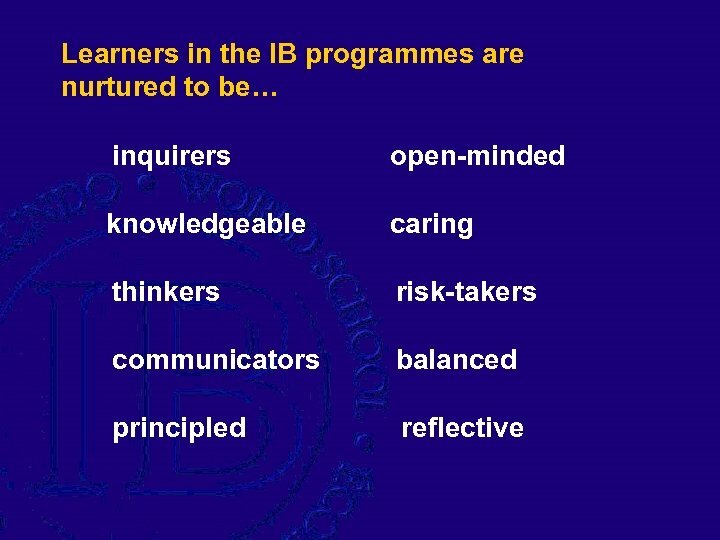 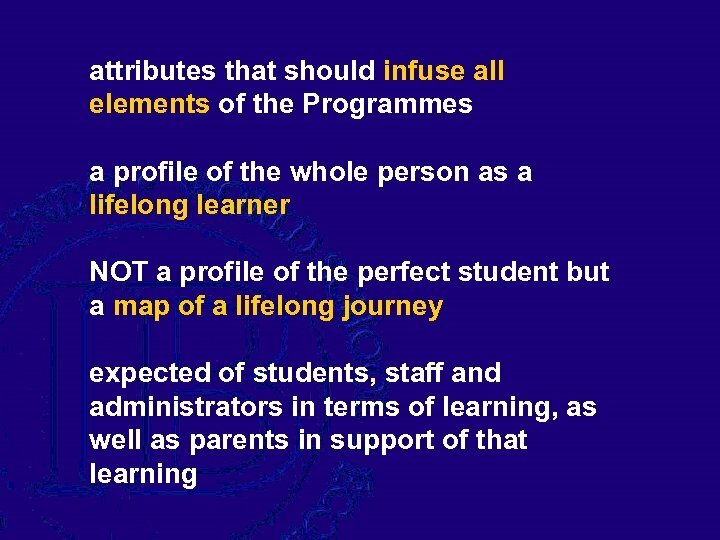 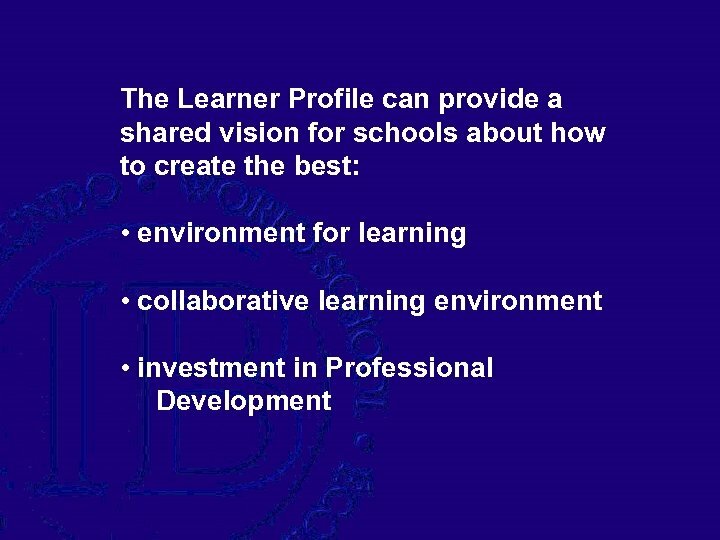 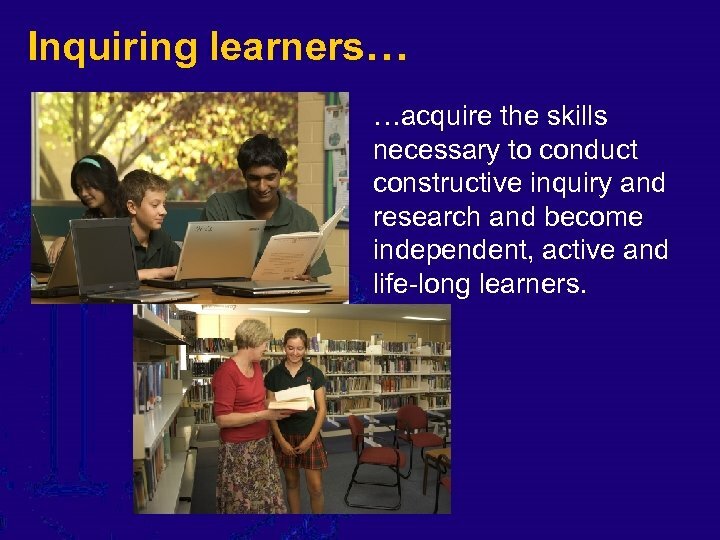 Inquiring learners… …acquire the skills necessary to conduct constructive inquiry and research and become independent, active and life-long learners. 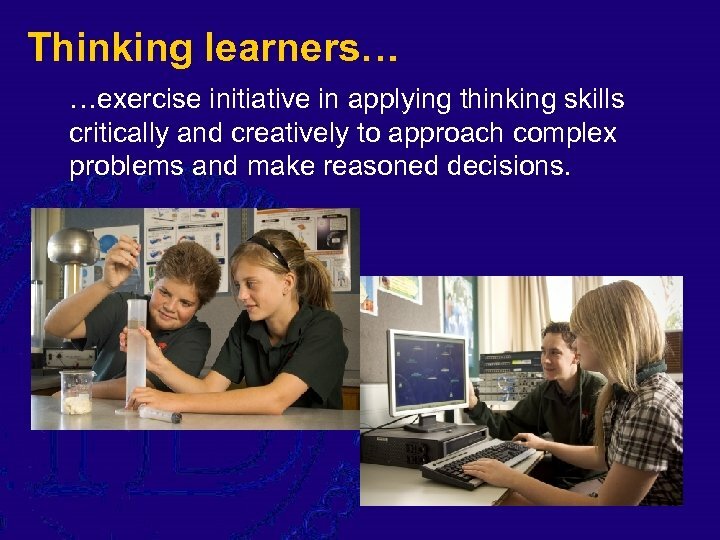 Thinking learners… …exercise initiative in applying thinking skills critically and creatively to approach complex problems and make reasoned decisions. 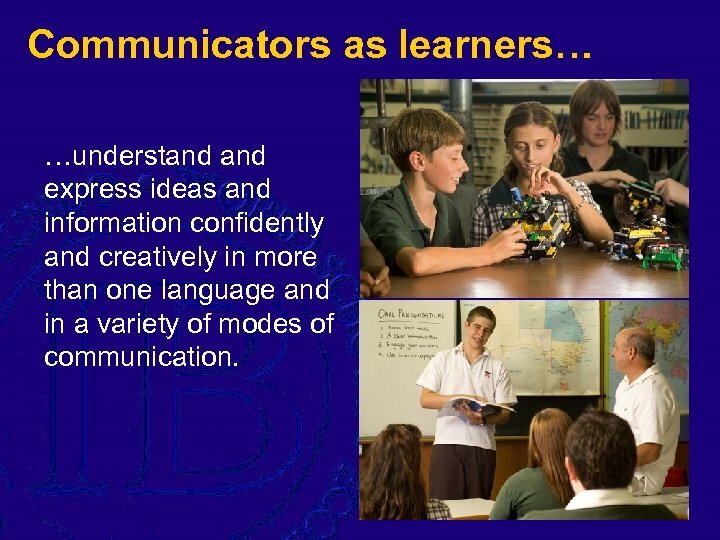 Communicators as learners… …understand express ideas and information confidently and creatively in more than one language and in a variety of modes of communication. 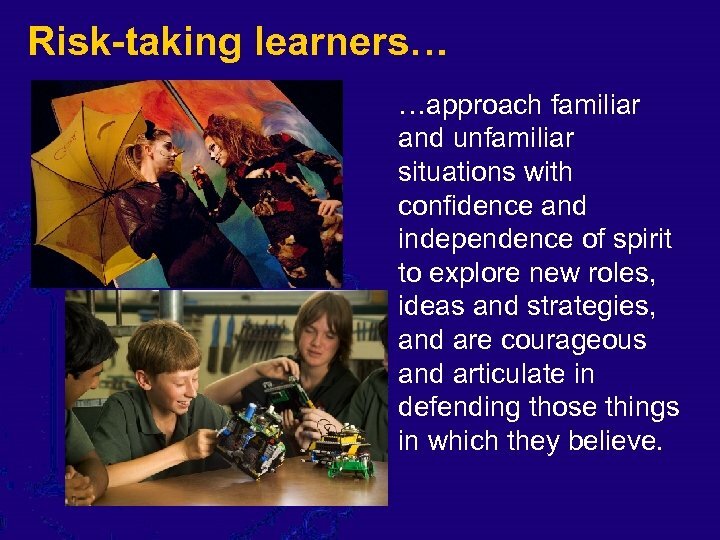 Risk-taking learners… …approach familiar and unfamiliar situations with confidence and independence of spirit to explore new roles, ideas and strategies, and are courageous and articulate in defending those things in which they believe. 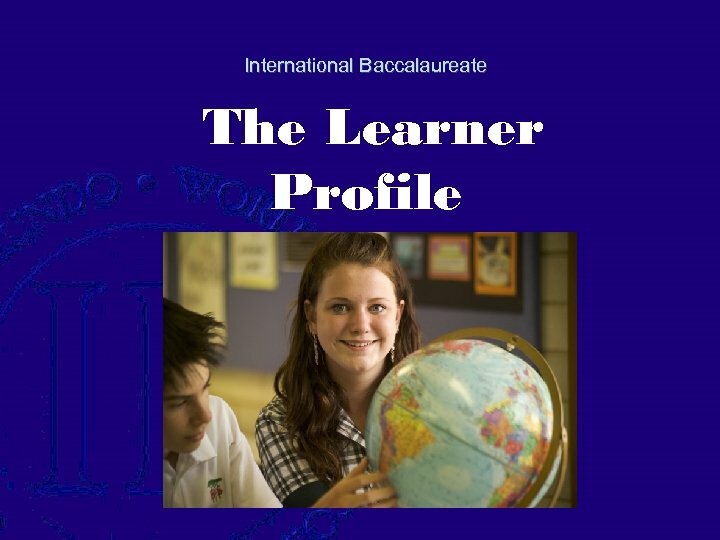 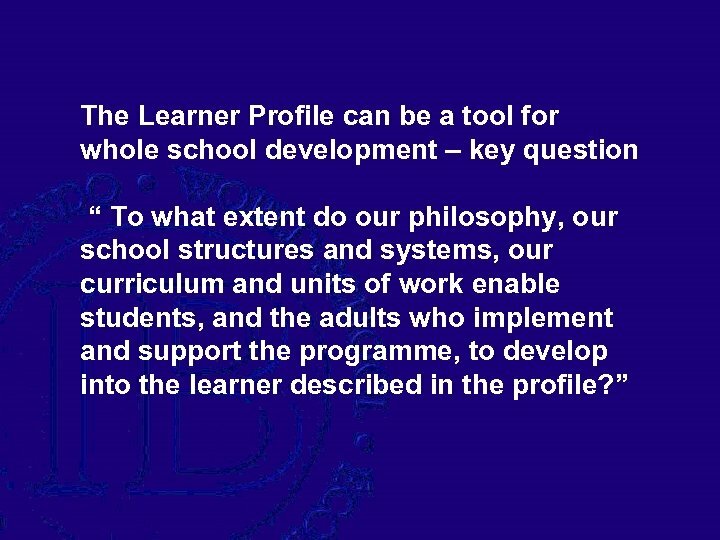 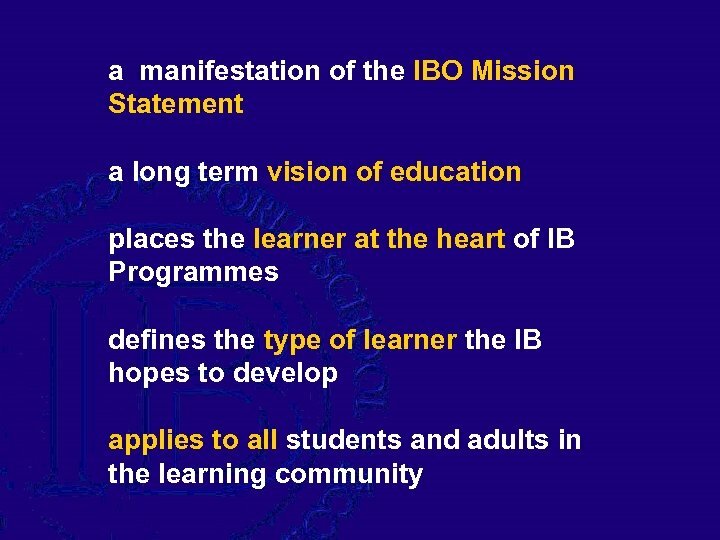 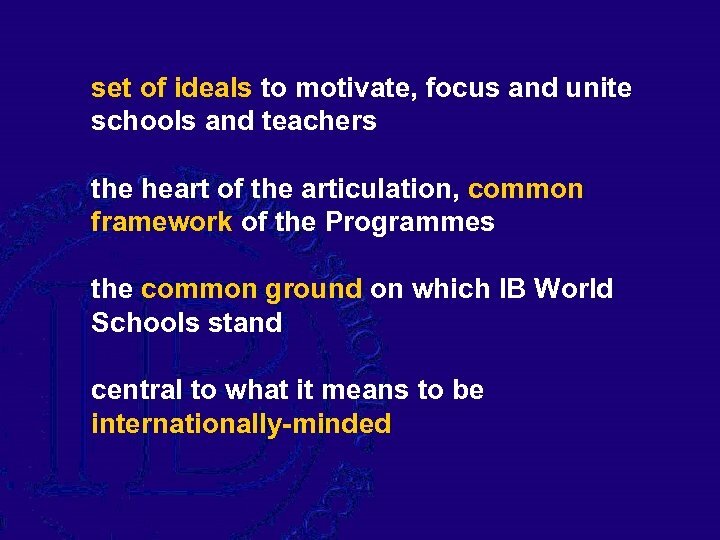 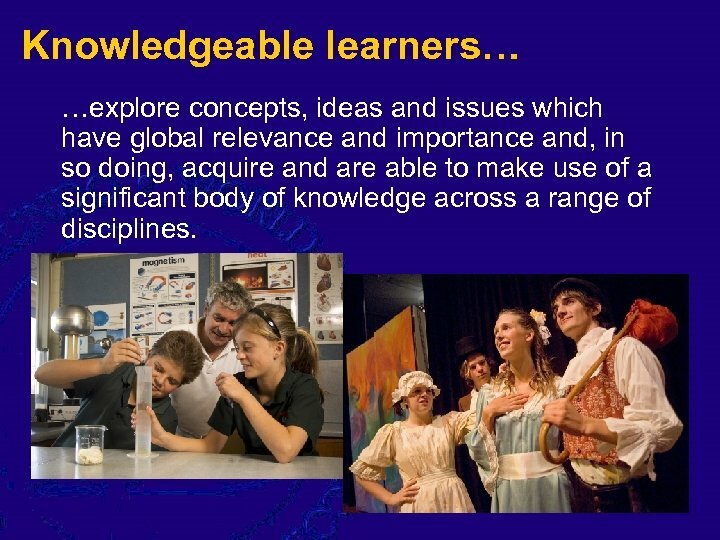 Knowledgeable learners… …explore concepts, ideas and issues which have global relevance and importance and, in so doing, acquire and are able to make use of a significant body of knowledge across a range of disciplines. 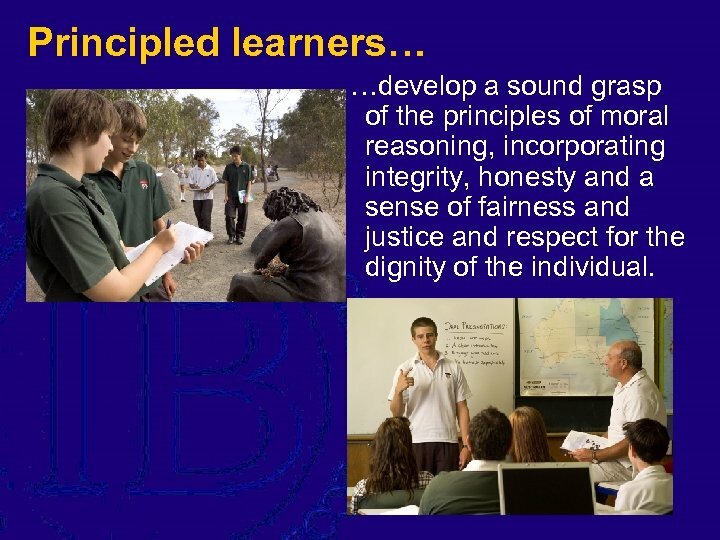 Principled learners… …develop a sound grasp of the principles of moral reasoning, incorporating integrity, honesty and a sense of fairness and justice and respect for the dignity of the individual. 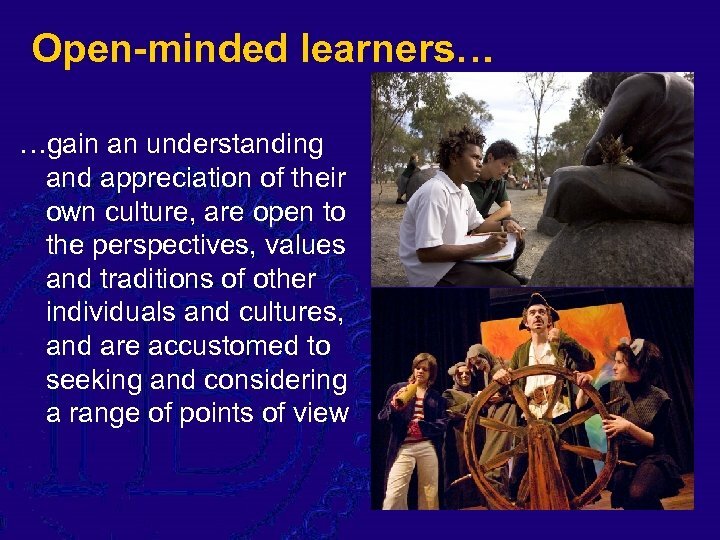 Caring learners… …show empathy, compassion and respect towards the needs and feelings of others, and have personal commitment to action and service to make a positive difference to the environment and the lives of others. 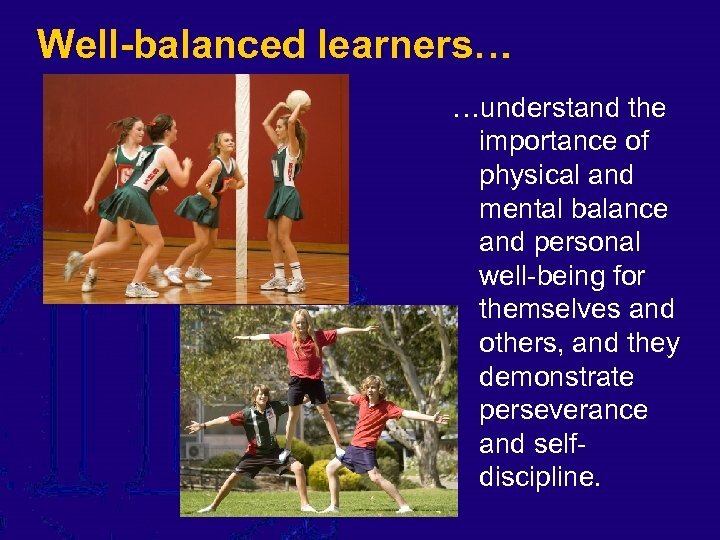 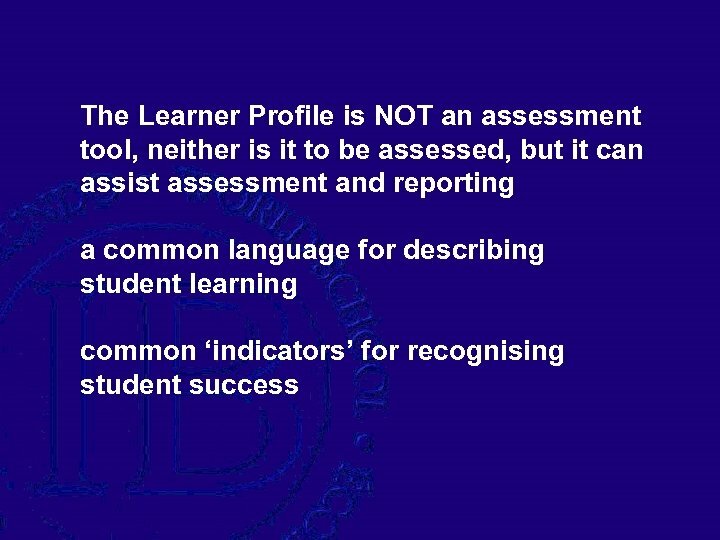 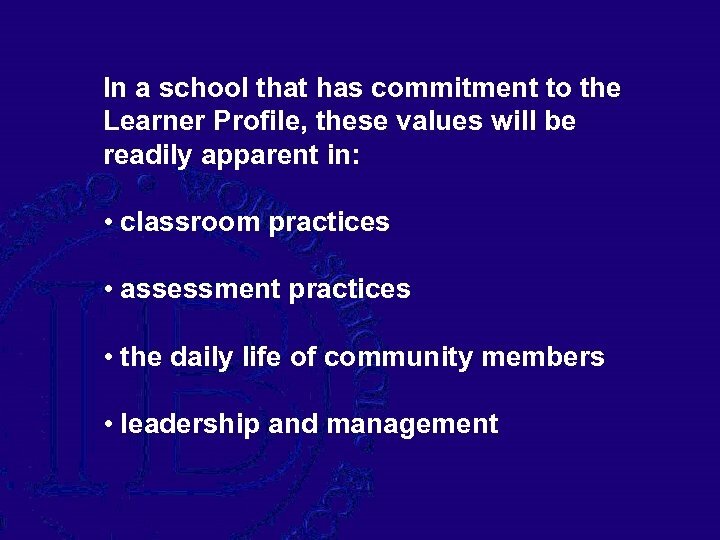 Well-balanced learners… …understand the importance of physical and mental balance and personal well-being for themselves and others, and they demonstrate perseverance and selfdiscipline.